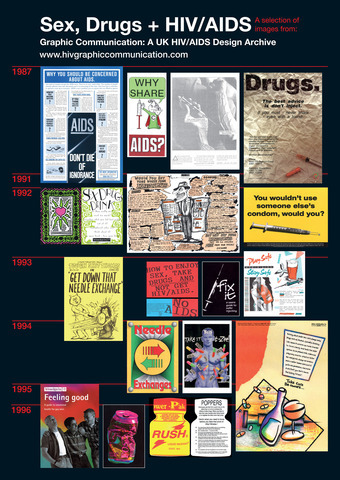 2 posters designed for display at The SEXualCHEMistry Summit: 'Gay Men, Sexual Health, Self Harming Behaviours & Drug Use' to illustrate the visual chronological development of UK health promotion campaigns around gay men, drug use and emotional wellbeing. A slide show of imagery from my HIV archive project was also compiled and shown in between presentations. This was an opportunity to engage directly with an audience of professional health promoters and clinicians and promote the archive.